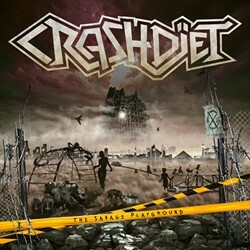 Frontiers Records is excited to announce the release of Crashdiet’s anticipated new studio album ‘The Savage Playground’ on January 25th in Europe (excluding Scandinavia) and January 22nd in North America. A leading force in the Swedish “sleaze rock” scene of the 2000s — a revival of the glam metal of the 1980s, but with a more pronounced punk element — Crashdiet for the first time manage to release their brand of down and dirty rock and roll simultaneously all over the world. In April of 2010 the band’s third album ‘Generation Wild’ pretty much summed up the extraordinary but yet tragic history of a band, determined to never give up their dream. Crashdiet has become known as a band with a huge following of diehard fans, and the massive interest for them never seems to fade. There has been extensive touring during the course of ‘Generation Wild’ and the absolute highlight saw the band conquer Hollywood and New York City with sold out shows at the Whisky A Go Go and Webster Hall. The band also supported their heroes Motley Crue and Ozzy Osbourne. “Supporting Motley Crue in Helsinki and headlining Whisky A Go Go have been the highlights of the Generation Wild tour,” says guitarist Martin Sweet. With the new studio album ‘The Savage Playground’, recorded during summer/autumn 2012 in their native Sweden, the band has their minds set to break through on a world-wide basis with a tour that will see the band going back to the US as well as going to Japan for the first time. “We will put a lot of effort into the US for our new tour. We will start in Scandinavia in February, then we head to the US and Canada. Coming back end of April to do UK and then Europe and Japan will follow with Festivals in the summer and then South America to kick off in the autumn,” continues Sweet.